Hi! 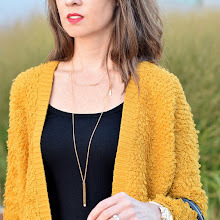 This is Lisa from Daily Style Finds and I am so excited to introduce my blogger friend, Marta from Sweaters, Stripes & Sweets for our Friday Feature. Be sure to stop by her blog and also check out her Facebook page. Are you married? What marriage advice would you give to a couple getting married? What have you learned? Yes I am and in May we will be celebrating our 10 year anniversary! Wow time really does fly…advice I would give to a couple getting married is to make sure you are on the same page with life goals, values and aspirations. It may sound obvious but sometimes I think couples can get wrapped up in the romantic side of the relationship that they can overlook some of these key issues that can cause challenges later on if you both want different things especially when it comes to children, religion and so forth. Also, make sure you have fun together and do things such as date nights even after having kids. Friendly, trustworthy, introvert (but I would definitely say I’m an extroverted introvert). What would you consider your greatest accomplishment and why? This may sound cliche but by far my greatest accomplishment has been raising my two sweet girls. Parenting is challenging, exhausting and there are those days where you just want to plain quit or call your own mommy for that matter but boy are those two little cuties the joy of my life! There is nothing that can take away my stress or lift me up when I’ve had a rough day at work like the sweet hugs and kisses I get when I walk through the door. It’s also such a great feeling to see your kids become caring and compassionate little people which validates that yes you are doing something right as a parent. What hobbies do you have other than blogging? One of my favourite pastimes is watching movies. I’m an avid movie goer and really enjoy everything about movies from the soundtracks, special effects, great story telling and the magic that a film can create. My favourite movie(s) of all time will always be the Lord of the Rings trilogy. What inspired me to start blogging? After having my girls and feeling pretty frumpy for a few years I knew I had to get my fashion mojo back and put more effort into self-care. Fashion has always been a love of mine and after spending time following and admiring amazing mom fashion bloggers I felt inspired to take the plunge myself and have never regretted doing so. My blog is my creative outlet that let’s me escape the stressors of my 9 to 5, it really feels like making a dream of mine into a reality. What is your favourite style season and why? Fall is definitely my favourite style season, as you can tell by my blog’s namesake I clearly have an obsession with sweaters so this time of year is my all-time fave when it comes to personal style. I also love layering and being cozy in warm fabrics and that fact that you can still dress light. The rich colours always get me and since I also have a thing for scarves and booties fall is the ideal fashion season. What is your favourite (or dream) vacation destination? My favourite vacation destination is Sardgena, Italy where the hubs and I travelled for our honeymoon. It’s an island off the coast of Italy and it is beautiful, the water was magical and it felt like you were in Bora Bora rather than somewhere in Europe. The food of course was to die for and we had 2 yummy gelato’s a day…because why not?! It was quaint and we really enjoyed renting a car and driving around the island to see all of the breathtaking beaches. We spent the rest of our honeymoon in the south of France and that was another favourite destination of mine. In terms of dream vacations I have always dreamed of travelling along the entire coast of California by car and hitting all of the amazing places such a Big Sur.